Steal the Show by Thomas Kaufman, a Mysterious Review. 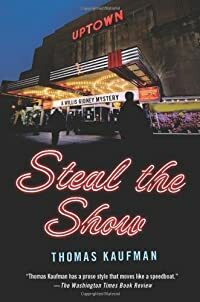 Review: Desperate for cash to help fund his efforts to adopt a baby girl he saved, Willis Gidney takes on a case to gather evidence on a possible video piracy operation … even if it means he'll have to break the law himself to get it … in Steal the Show, the second mystery in this series by Thomas Kaufman. The operation goes more or less according to plan — these kinds of jobs never go exactly as planned — but Gidney's client, Rush Gemelli, turns out to have an ulterior motive, and he's using photos of Gidney breaking and entering as leverage to make sure he goes along. He wants Gidney to get close to his father, Chuck Gemelli, who is head of the Motion Picture Alliance Council, and is in Washington DC promoting a new technology to prevent piracy. Rush's reasoning for Gidney to be involved is a cover for something else, and he knows it, but Gidney's back is up against the wall. He can't allow Rush to release those pictures and jeopardize his chances for adopting the little girl he's come to call Sarah. The primary storyline in Steal the Show involves Gidney trying to extracate himself from Rush, at first doing as little as necessary to be useful to Chuck Gemelli, but all the while being slowly drawn into a complicated scheme to discredit the anti-piracy technology. It's not unfair to say that it's hard to follow exactly what's going here while it's going on, but that's probably intentional on the part of the author: Gidney isn't doing a much better job of "getting it" than the reader is. But his desire to keep his record clean — relatively clean — for the adoption services department (DCAS) overrides any hesitation he has for continuing the case. Which leads to the significant secondary storyline, that of Gidney adopting Sarah (who DCAS insists on calling Baby Doe). Steal the Show opens with Gidney saving her from a fire that claimed the life of her (presumed) mother. As an orphan himself who spent years under the care of DCAS himself, he's determined not to allow her to suffer that same fate. Hence the adoption. But given Gidney's chosen profession, a barely employed private investigator, he's hardly father material in the eyes of DCAS. And even the reader has doubts: not only is Gidney unwilling to make sacrifices for his potential child — like taking a "real" job when he's offered one — he's not even willing to compromise on her behalf. But the author deftly handles how this particular storyline plays out, with an incredibly poignant scene towards the end between Gidney and his adversary at DCAS that lays everything out on the table, something he was never able to do with his client Rush Gemelli. Steal the Show is both a very typical PI-type crime novel and yet a very atypical one as well. It's an interesting mix, but an immensely satisfying one. Acknowledgment: Minotaur Books provided a copy of Steal the Show for this review.